Bereits am Anfang des Jahres haben die Entwickler von Blizzard verkündet, dass alle Vorbesteller von Reaper of Souls irgendwann einmal die Dämonenjägerin „Valla“ als kostenlosen Charakter für ihr kommendes Moba „Heroes of the Storm“ erhalten werden. 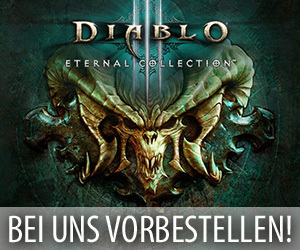 Der vor Kurzem als Teil des Übergangs in die letzte Testphase der Alpha aufgespielte neue Patch 32455 hat diesen aus Diablo 3 bekannten Helden nun für alle berechtigten Tester freigeschaltet. Die Vorbesteller von RoS ohne einen Zugang in die aktuell laufende Testphase von Heroes of the Storm werden ihren Charakter erhalten, sobald sie entweder einen Key bekommen oder das Spiel in eine offene Beta wechselt. Back in February, The Diablo III team announced a number of pre-order items for Diablo III: Reaper of Souls, including a future unlock of Valla the Demon Hunter in Heroes of the Storm. With the launch of the final phase of the Technical Alpha upon us, we wanted to take a moment to let everyone know that if you digitally pre-purchased the Reaper of Souls expansion or redeemed your Reaper of Souls game key via your Battle.net account on or before 11:59 PM PST on March 31, 2014, you should now have Valla unlocked on your Heroes of the Storm Battle.net account. Pre-purchasing Diablo III: Reaper of Souls did not guarantee a spot in the Heroes of the Storm Alpha or future Beta tests, but if you pre-purchased Reaper of Souls and you are still awaiting access to Heroes of the Storm, fear not! Valla will be ready and waiting for you as soon as you are able to join us in the Nexus.